The argument made by many experts is that while taxpayers will probably end up losing between $100 billion and $200 billion on TARP ; the program helped rescue the economy from a second Great Depression. CNNMoney has posted a pair of interesting graphics tracking how taxpayer dollars were spent over the past 12 months, along with likely losses. 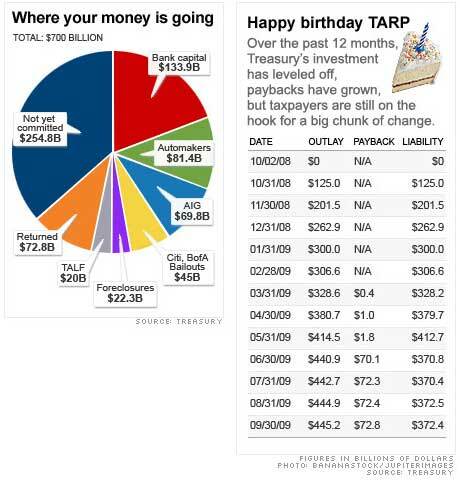 TARP by the way celebrated its first birthday on Oct. 3. The program ended up being used for many purposes it was not initially intended for, like saving insolvent international insurer AIG (NYSE:AIG), automakers and helping struggling homeowners.